There are many factors that go into designing the ideal oven — supreme cooking capability is a must, but energy efficiency and the use of materials with reduced environmental impact is also important. How can all of these different factors be combined to create an oven that is optimized for the best performance? Engineers working at Whirlpool Corporation along with the European green energy initiative, GREENKITCHEN project, found that multiphysics simulation was vital to the success of their design process. GREENKITCHEN project, a European initiative that supports the development of energy-efficient home appliances with reduced environmental impact, was founded to help develop and share knowledge about home appliance manufacturing in order to advance eco-friendly strategies for improving energy efficiency in households across Europe. 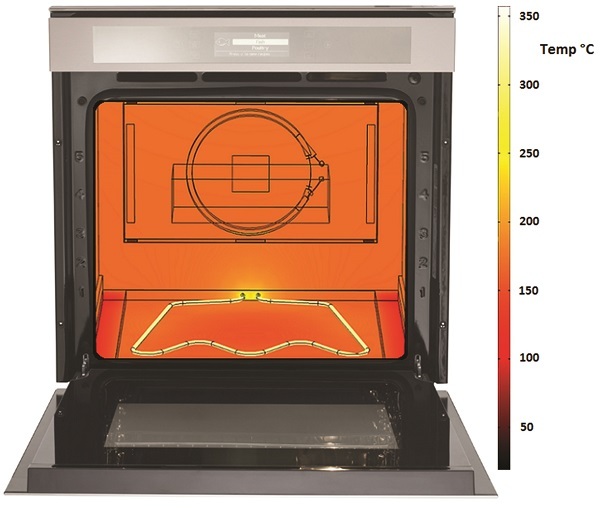 COMSOL Multiphysics model of Whirlpool’s Minerva oven showing the predicted temperature distribution of the oven’s surfaces. One of the main goals of the project is to improve heat exchange in domestic ovens. Since ovens are one of the least energy-efficient appliances in a household ( only about 10-12% of the input power is used to heat the food being prepared ), they offer one of the best areas for improvement in regards to energy efficiency. Using Whirlpool’s Minerva oven as a model, researchers at Whirlpool R&D working on the GREENKITCHEN project modeled the heat transfer processes of conduction, convection, and radiation in the oven. “Our goal for the project is to reduce energy consumption of Whirlpool’s ovens by 20 percent,” described Nelson Garcia-Polanco, Research and Thermal Engineer at Whirlpool, in an article from the 2014 edition of Multiphysics Simulation. This improvement in efficiency would result in a reduction of 50 million tons in CO2 emissions per year in European households. 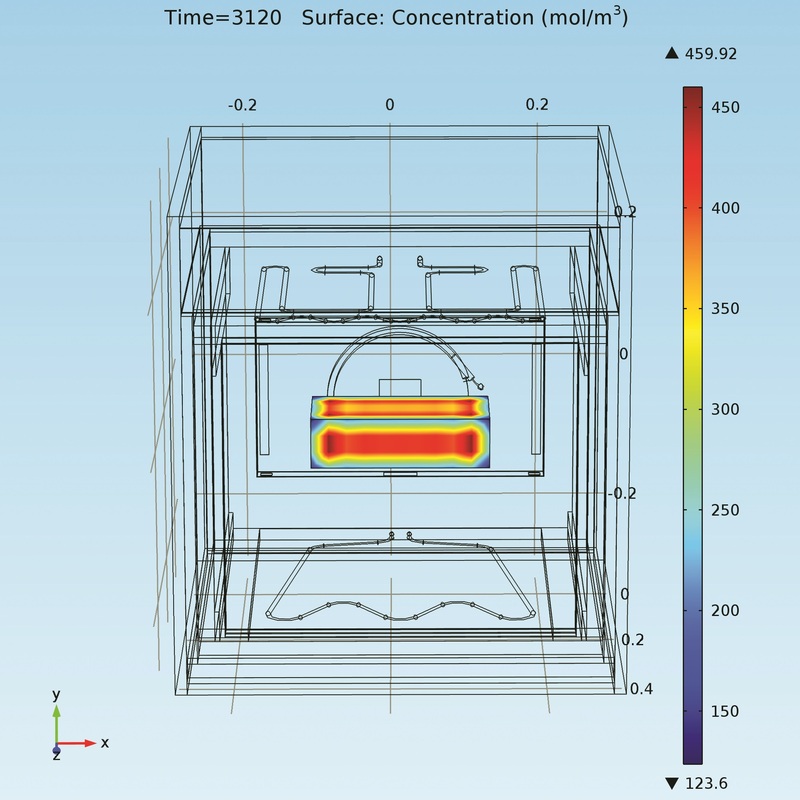 The first step in the project was to create a COMSOL Multiphysics model of the oven and verify its accuracy by performing experimental tests. One of the tests used by the team was the “chilled wet brick test” or “brick test”, in which a wet brick representing a food matrix is heated from 5°C to 60°C over a set period of time. 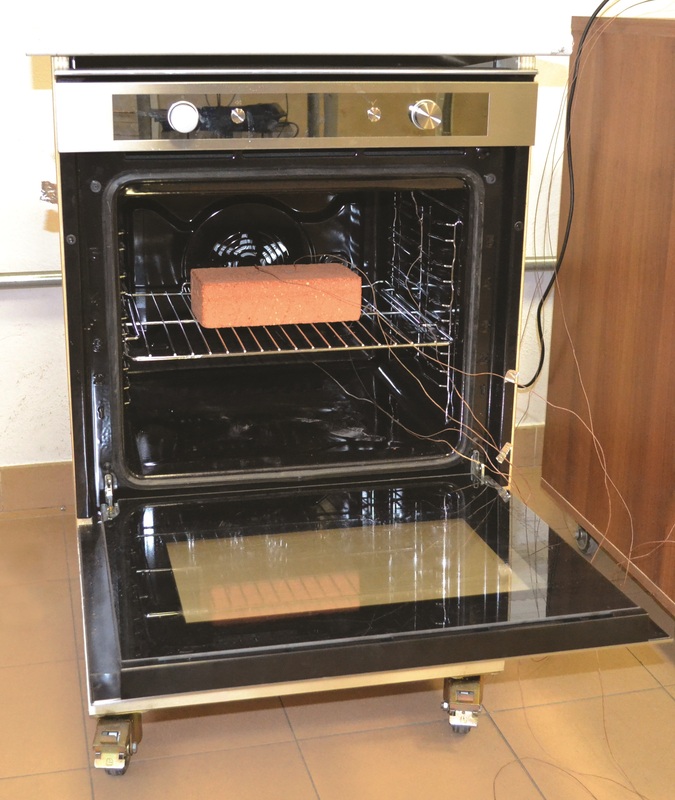 The temperature distribution and evaporation of the water from the brick is then measured to determine the oven’s performance and energy usage. Below are images showing both the model of the oven and brick (right), as well as a photo of the oven during experimental testing (left). Using the model, Garcia-Polanco measured the temperature profile and water concentration in the brick over the course of a 50-minute heating cycle at 200°C. This information was then compared to the results from the experimental test in order to verify that the oven simulation could reasonably predict the temperature changes throughout the test’s duration. Water evaporation from the brick was also taken into account. The model predicted that an average of 166 grams of water would have evaporated after the 50-minute heating cycle, while the actual value was found to be only slightly higher, at 171 grams. 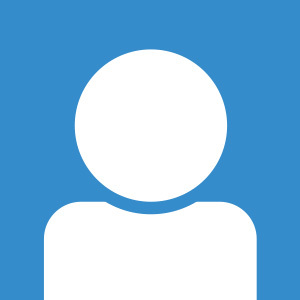 With this information about water concentration and heating profiles, Garcia-Polanco and the GREENKITCHEN team will be able to optimize the oven to achieve a high energy efficiency, while being able to maintain the quality of the final product — ensuring that the energy-efficient oven distributes heat throughout the oven and provides optimal performance in the cooking process. Currently, Garcia-Polanco and the team are using the validated model to test design ideas for both efficiency and performance. By the way, Garcia-Polanco will discuss their project and designs further in his upcoming keynote speech on “Multiphysics Approach to Improving the Performance of Domestic Ovens” at the COMSOL Conference 2014 in Cambridge, UK.